Protecting transition hose in the cell of the wall leaves extra space so the dryer can be placed flush to the wall. Self-trimming bead finishes fast for a clean, built-in look. means shorter drying times and this saves on energy bills and appliance wear and tear. Today, you can place the dryer flush to the wall without crushing the exhaust hose or restricting airflow. Install the Dryerbox® for safer, roomier and more efficient homes. 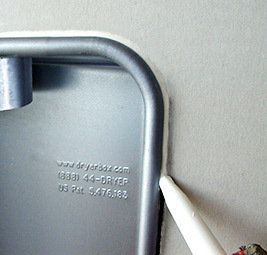 In the past, homeowners had to put up with the inefficient venting of their dryer appliance exhaust due to numerous friction causing bends or kinks in the flex duct hose that connects the dryer to the wall exhaust pipe. Lint build-up and a fire hazard are the unwelcome by-products of these annoying bends. In order to accommodate these flow restrictive bends, the dryer appliance had to be located five to six inches away from the wall, taking away from valuable living area. Choosing the Dryerbox recessed exhaust receptacle makes for a simpler, cleaner install that truly finishes the laundry right. You’ll protect the exhaust hose neatly in the wall, and you’ll be able to place the dryer flush to the wall without crushing the hose or otherwise restricting airflow. 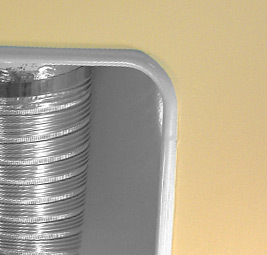 Adding this receptacle makes homes roomier and more efficient. It also makes them safer by reducing the fire hazard associated with dryer venting problems. It’s even UL Classified for a 1-hour wall. "Your Dryerbox is ingenious in it's simplicity." "It's an obvious solution to lessening the fire hazard relating to the dryer." Are you in our Database?